OAK RIDGE, Tenn. – On Monday, Lt. Gen. Frank G. Klotz (Ret. ), Under Secretary for Nuclear Security and Administrator of the National Nuclear Security Administration, presented a U.S. Department of Energy Gold Medal Award to Y-12 Historian D. Ray Smith today. Smith, who is retiring later this month, was honored for his role in helping create the Manhattan Project National Historical Park (MPNHP). In honoring his substantial contribution to the NNSA mission, Klotz noted that Smith’s efforts “to preserve Y-12’s history and promote Oak Ridge’s role in American history” will indeed be his legacy. 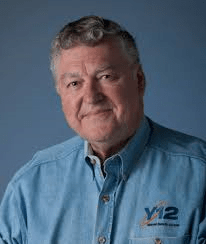 Smith has more than 48 years of service at Y-12 and became the Y-12 Historian in 2005 after many years of working in the site’s maintenance organization. In 2005, he helped organize the largest public tour of the last existing set of Manhattan-era calutrons in Building 9204-3, also known as Beta 3, with more than 1,200 people touring the facility. In 2012, Smith testified in front of Congress in support of the Manhattan Project National Historical Park legislation. His testimony and other efforts helped Congress’s decision to create the MPNHP in 2015, with Y-12’s Pilot Plant and the Beta 3 calutrons listed as part of the park. Smith was named the City of Oak Ridge Historian in 2015 and was recently selected to serve on the Tennessee Historical Commission. He has also played a key role in the planning and development of a new American Museum of Science and Energy that will open in 2018.